From the one with Romance Thriller novel! 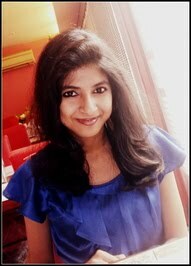 Purba Chakraborty is born to a Bengali family in Kolkata on 17th June 1990. She is a content developer/writer by profession, author by passion and a blogger by choice. She has authored two books ‘WALKING IN THE STREETS OF LOVE AND DESTINY’(2012) and “THE HIDDEN LETTERS…”(2014. Many of her short stories and poems have been published in magazines and anthologies namely “Stories for your Valentine” and “Fusion-A mingled flavour mocktail”. She is currently working on her next manuscript. Connect with her on Facebook, Twitter, Instagram, Blog, Goodreads. 1: Since this is your 3rd Novel, which one is your favourite out of all 3? It is extremely tough to choose one as all the three books are special to me for different reasons, but right now, it is “Canvas of a Mind”. 2: What kept you going? My passion for writing. I know that I won’t be able to survive even a month without writing. I live to write and I write to live. 3: Quotes, Poetry or story? Which among these do you like to write most? Poetry. Because it comes effortlessly to me. Even when I am going through a very challenging or a tough time in my life, I can express through poetry. 4: According to you, What Makes plot interesting? Interesting/relatable characters in offbeat situations, fighting with their own demons and overcoming challenges can give birth to an interesting plot. 5: A book that you read recently? 6: what are your passions other than writing? Music. I love singing and listening to various kinds of music. 7: The book ” Canvas of a Mind” is all about mystery, love, faith, and destiny. Is it connected to your real life too? No. It is fiction but largely inspired by people I have come across in my life. 8: How do you balance work and writing? I work in the morning and after 7 pm, I give time to my creative writing. 9: What is writing for you in one word? 11: Message for Aspiring writers? Read a lot. Start blogging to polish your writing skills. And cultivate patience.